Toasted garbanzo beans are one of our favorite crunchy, salty, pop in your mouth, irresistible and surprisingly healthy snacks. They are great for munching everywhere: at work, on the couch, cocktail hour and as a pre-workout energy boost. Our favorite way to eat toasted garbanzo beans, however, is tossing them on top of a salad with a zesty homemade dressing! Those crunchy little morsels are a great two-for-one when used on a salad. The garbanzo beans serve as a one-two punch: a super healthy protein substitute for chicken, turkey or ham. Second, the toasted beans act as a substitute for croutons as well! 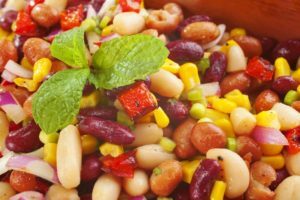 This makes the salad not just high in protein, but very low in carbs! Because garbanzo beans are a Mediterranean staple, we decided to round out the rest of the salad with more Greek flavors like feta cheese, kalamata olives, tomatoes and cucumber. Feel free to use your favorite salad dressing or a tzatziki sauce for extra Greek flavors, but if you are feeling a little adventurous, we have listed a simple and light dressing that goes wonderfully with this salad. It bursts to life with so many fresh flavors like lemon, garlic, oregano and dill. Just be sure to make a little extra, because you’ll want to toss this on all your other salads! Perfect on its own for a light lunch or dinner, this is also a great side dish for grilled chicken or lamb to complete the Greek feast. Lay paper towels on a baking sheet and pour the garbanzo beans on top. Grab more paper towels and rub them on top of the beans, pressing lightly to remove as much moisture as possible. 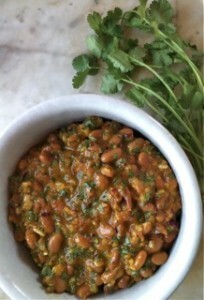 Remove the paper towels and discard any skins from the beans. Add the olive oil and mix the beans thoroughly with your hands. Place the beans in the oven for 10-15 minutes or until lightly toasted. Mix with paprika and salt and set aside. Prepare the dressing by adding all of the ingredients together in a container that has a secure lid. Shake the ingredients until mixed thoroughly. 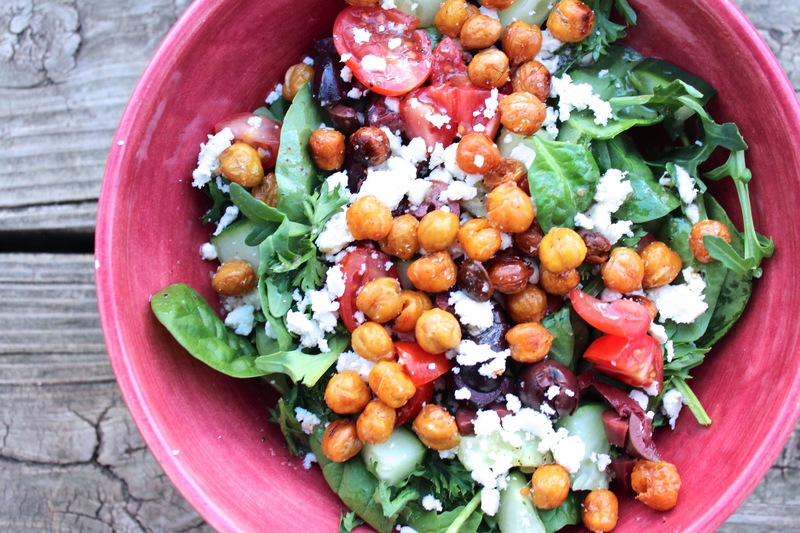 Mix your salad ingredients and toasted garbanzo beans together in a bowl and add 1 to 2 tablespoons of dressing. 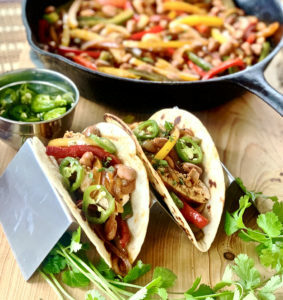 Hankering for more recipes using beans with super fresh ingredients? 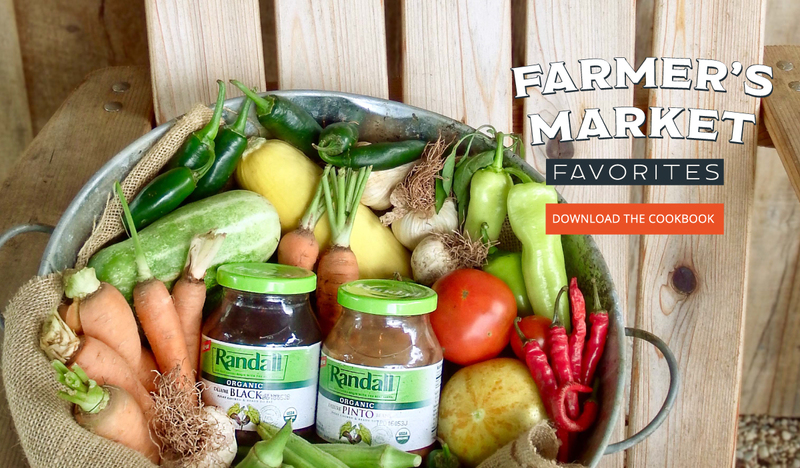 Grab a copy of our Farmer’s Market Favorite’s cookbook. 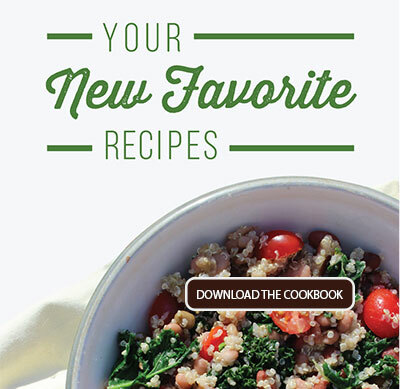 With spring just around the corner, this cookbook will guide you to a spring and summer of fresh and healthy eating with bean salads and other bean recipes using the fresh vegetables you can find at your local farmer’s market. Grab your free copy here!